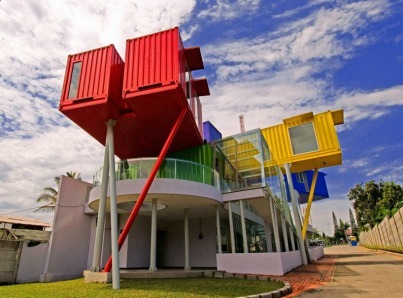 Made from seven shipping containers, this colourful library stands out in Batu, Indonesia. Built as high as the tree tops surrounding it, the third level containers are supported by long steel columns. Yet another way of recycling used shipping container. The children of this area are sure to have huge imaginations visiting this space. At USD820 for each container, this design is not only affordable but eye catching as well. For more information on this structure, head to this website.